Jeff Cable's Blog: Hey Canon DSLR users: Count your shutter releases! 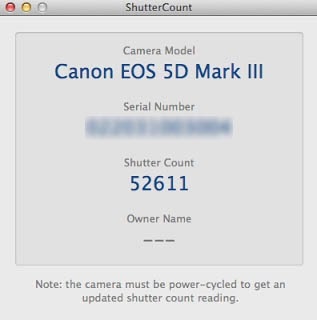 Hey Canon DSLR users: Count your shutter releases! I don't know about you, but for the last 10 years I have always wondered how many shutter releases I had on my cameras. I even had a friend offer to buy one of my older cameras, and I told him "you don't want my used cameras, since I probably have shot this past the shutter warranty." Well...a couple of weeks ago I saw something on the web that intrigued me. 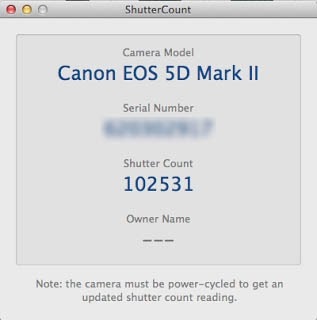 It was an application for my Mac that would show me the shutter count of my DSLRs. And amazingly enough, the app is called ShutterCount. I know, I know, you are thinking, "how did they come up with that name?" This application costs only $2.99 on the Apple App Store and it works very well. The application is very easy to use. All you need is a standard USB 2 cable (and one comes with each camera). You download ShutterCount, connect the camera to your computer using the USB cable, and then launch the app. You may have to power cycle the camera (turn it off and on) for the software to see the camera. 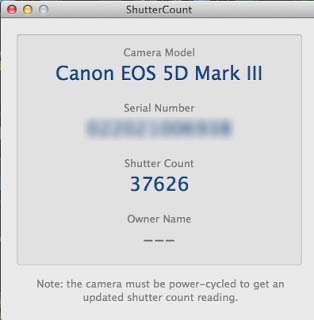 At that point, you are shown the camera model, serial number and shutter count. So handy! Interesting that one of my 5D Mark III cameras has so many more shutter releases than the other. When I travel, I usually grab the same camera, which probably explains why one has so much more use than the other. You can see that my Canon 5D Mark II cameras worked hard for me with 250,000 shots between the two bodies. 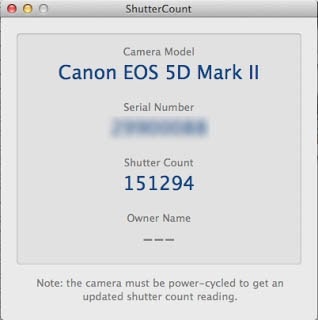 If you are like me, and own Canon cameras and a Mac computer, check out ShutterCount. For $2.99, it was a no brainer! does it work with 5d classic and 7d. I have always wondered why the camera manufacturers do not provide a way for the user to access this information without using a third party app. I have always wondered why the camera manufacturers do not provide this information and we have to use a third party app. Or, you could just upload a recent picture to myshuttercount.com. 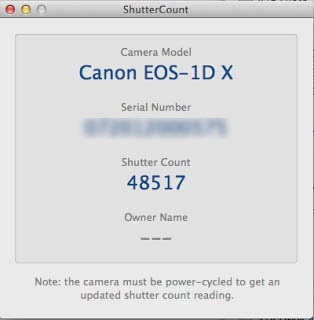 I can get the shutter count information from the EXIF data in Photoshop....why pay for an app? What about us people that own canon camera but don't own a iPhone. what else can we use? 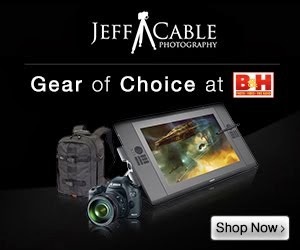 Jeff, why is shutter count important? The Windows version of this app is available! It looks and works the same way the Mac version does, except that history logging is not (yet) available in the Windows version.